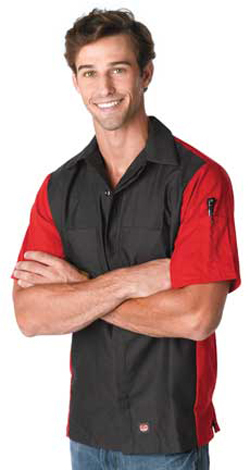 RedKap Adult 4.25 Ounce Short Sleeve Crew Shirt. 4.25 oz. Cotton ripstop texture. 65% polyester/35% cotton, permanent press. Touchtex technology with superior color retention, soil release and wickability. Concealed, no scratch, button-front placket. Two button thru hex pockets with pencil stall on left front pocket and utility pocket on left sleeve. Sizes: S-3XL. Colors: Black/Charcoal, Black/Red, Charcoal/Grey, Charcoal/Royal Blue. Style Ships From Nashville, TN.